Here on Techlicious, I talk about Big Data a lot – that is, how companies use the information they have about you to better sell you products and empty your wallet. Well, data is a double-edged sword. You can also use it to squeeze every last dime out of the stores you regularly buy from, keeping that wallet full. How? Simple: price tracking. I’ve put together a list of four great price tracking apps, websites and services that can help you figure out the best times to buy. That way, you can save money no matter how or where you like to shop simply by staying informed. Take a look. People use social network Pinterest for myriad reasons, but it tends to be especially popular with people who love to shop. The reason is simple: There are plenty of great Pinterest pages out there full of curated fashions, home goods and similar items that match your tastes exactly, all just waiting to be discovered. Naturally, buying everything you like on the site would be too expensive. But the site makes it easy to start your own Pinterest page full of “wish list” items, complete with pricing information. Once pinned, should any item you’ve added to your list decrease in price, Pinterest will send you an email alert. Pinterest currently tracks a large number of popular retailers and sites like Anthropologie, Etsy, Sephora, Urban Outfitters and more. To learn more about Pinterest and how to use it, check out Techlicious’s Pinterest 101: Understanding the Basics and Pinterest 102: Tips for Smarter Pinning guides. Do you spend a lot of time browsing the racks of fancy department stores like Neiman Marcus trying to find a bargain? Anxiously awaiting Nordstrom’s twice yearly sale? If searching for a great deal at upscale mall stores excites – and why wouldn’t it – then you may want to check out the Nifti app. That’s okay, though – Nifti’s strength isn’t in searching for everyday items. It’s the curated “Nifti Picks,” a selection of incredibly cool items that have recently declined in price. I found a gorgeous reclaimed wood wine rack, a price-cut Vitamix blender and a 21% off deal on Beats Headphones. Of course, the tracking and price chart features work for these items too, in case you want to roll the dice on that tree stump nightstand decreasing in price. It is just a piece of wood, after all. Nifti is a free download for iOS devices on the Apple App Store. 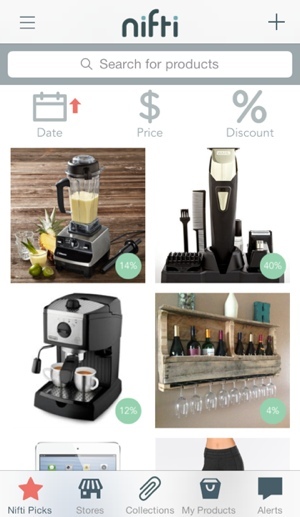 Most price-tracker apps focus on helping you determine when the right time to buy an item is. But just because you’ve already bought an item doesn’t mean your opportunity to save money has ended. Shopping assistant site Slice helps keep track of your spending history, alerting you if it discovers you’re eligible for a price adjustment. See, Slice syncs to your Gmail account, automatically keeping a browseable database of your online purchases and emailed store receipts. If an item you’ve bought at one of the 23 retailers it tracks with price adjustment policies (i.e., Best Buy, Nordstrom, Zappos), Slice will automatically let you know. Sadly, my initial download of Slice wasn’t able to find me any price matching opportunities. It did, however, create an instant record of my online purchasing history, discovering 184 items I’ve spent a grand total of $9,250 on. If nothing else, it may guilt you into spending less … and that’s a kind of savings, right? Slice is a free download for iOS devices on the Apple App Store and for Android devices through Google Play. Are you looking to save a little bit of cash on your next visit to Amazon? If so, take a look at camelcamelcamel, a powerful website that monitors and tracks prices for both new and used items listed on Amazon.com using easy-to-read charts. Not only can the site tell you what the best price for an item is, it can also be set up to email or tweet at you when prices drop. The site is easy to use. Just find an item on Amazon, copy the URL in the address bar and paste it to the search bar on the site. Or, you can download the camelcamelcamel browser app and do the research right in the Amazon browser window. Either way, a comprehensive price history of pretty much every item sold on Amazon is right at your fingertips. If you’d like to cut your online shopping bill even further, check out our 6 Ways to Save Money Shopping on Amazon guide. This is the first I’ve heard of slice—it’s ironic in a way that pricezombie has the functionality of camelcamelcamel (along with a lot more stores) and the slice functionality with the post purchase tracker. One site to save you a fortune? We’ve just added our free price tracking feature for UK customers, we do this for free and perform it either automatically or manually. Really simple and emails you once a change is made or something (code, sale) will make it cheaper. In this day and age and all we can get is cant get a price on levis. All the good price tracking is gone and controlled. The old PCmag had a nice charting feature with a mind mapping display style that is to kill for. I use TrackIf.com to track more than just price changes. They track thousands of stores + all price history so that you can view when products go up/down in price. They also track out-of-stock items so you know when it’s back + you can track cars, concert tickets, vacation deals… really helped me cut my spam/weekly-daily email inbounds as I can just track the stuff I want for alerts. Hope more tools like this come out. Lootr.com is a great alternative, if you want something that is clean, easy to use and has cool trending drops. Did you Try Smart Price Monitor? it is a Chrome extension that allows you to track any price you like. I like it because it is a community that combines price tracking, user reviews, list functionality, and also surfaces a product’s best YouTube videos. When to buy matter best? I have found that it’s when you buy that matters the most. Many of these sites will move their prices up and then down hundreds of dollars and its just a matter of if you were looking at the right time. Check out https://pricetracking.ca/ if you are in Canada, they show the price history the the last price move. I just saw your wine list with the fun videos featuring Gary Vee…combining two of my favorite things: wine and shopping! So fun. I’ve been using http://zippooh.com for a year. 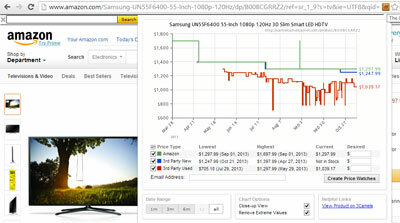 One click compare Amazon and eBay prices. Another one worth mentioning is EZ Price Alerts https://www.ezpricealerts.com/. I like the simple interface and works with multiple Amazon marketplaces as well. For saving money on Aliexpress: Aliexpress Price Tracker - https://goo.gl/OL9lgi. 1. Find the same products from Aliexpress. 5. Show App’s price, it’s always cheaper. There is also a tool called PriceMummy which allows you to track the prices from any website. What you need to do is basically put the link of the product in PriceMummy, choose the correct price if not already selected and that’s it. PriceMummy then will monitor the price of the product and alert you when price drops helping you decide when to buy. You can use PriceMummy by visiting the website or download their android application. We’ve been working on a new price tracker for UK consumers now for a few years and it tracks and updates 70,000 products an hour from Currys, Argos, Very, AO and lots more. Also shows you price history and provides free price alerts when it gets cheaper.